In November last year, Sydney-based muso and producer upsidedownhead realised a long-time goal, releasing his debut EP complex. Known to his many musical peers as Ross James – with whom he has worked for years as a session musician and producer – the EP’s birth marked the beginning of a new path for upsidedownhead, and the end of a lengthy journey of late, sometimes anxiety-fuelled nights toiling away on his own solo material. An accompanying animated video from the mind of Sadland Studio’s Thom Rawle is due to surface next week. Previous singles ‘get low (feat. Ric Rufio)’ and ‘my cave (feat. Dave Jenkins Jr.)’, received a warm welcome to the world. Both tracks were praised by online tastemakers CLASH and The Line Of Best Fit, spun on triple j and FBi Radio and added to playlists across Apple Music and Spotify. They also saw upsidedownhead awarded his first international spins from BBC Radio 1 and Amazing Radio (UK). 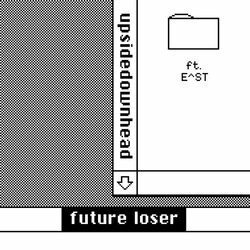 ‘future loser’ has already been embraced by DSPs, and is upsidedownhead’s most streamed track to date. We were first introduced to upsidedownhead through the enigmatically infectious ‘get low’ and the effervescent ‘my cave’. Now comes ‘future loser’, complex’s freshest cut, which see James teaming up with friend and ally E^ST, to deliver a warped R&B-tinged jam. The track is about learning to be ok with who you are, whatever happens, good or bad.